Hairstyles are the best way to give a new and improved look to a self. Giving a new look to the hair can not only help in attaining style but it has the power to pump up the overall look of an individual. Men and women irrespective of their style needs opt for a change in the hairstyle above anything. Women especially are very concerned about their looks and shell out huge money to make sure that they not only get their desired look but a different one. There are numerous styles when it comes to hair but choosing the right one can be tricky at times. There are various things to keep in mind before choosing the right kind of hairstyle. Long hairstyles with layers are the kind of hairstyle that is very much in trend and fashion these days. Women of varied age group try on this hairstyle to have a variation and look different in the crowd. If you too want to go for this kind of hairstyle then here are some options to try from. This particular hairstyle does justice with the name given to it in every way. The curls that are provided to the hairstyle are big curls which will look stylish on any women. The side swept hair comes down on one side and the remaining one is positioned in the back. This is one beautiful hairstyle that will look good on all women who wants a bit of variation in their look. If you love to tie up your hair and ponytails are your favorite then this one hairstyle might be just for you. Ponytails are not a sought-after option when it comes to a stylish hairstyle but this particular hairstyle has essentialities that can turn out be a winner for many. The hairstyle comes with bangs in the front and with a ponytail that falls with big curls. Curls are probably the most sought-after hairstyle that people tend to own and why not the style that curls give away is unmatchable. This particular hairstyle defines layered look in every way. The hairstyle comes with the long locks layered and curls are added to it for giving a style that makes it different from any other look. Women who have really long locks can try this hairdo for a beautiful appearance. Straight hairs are a classic hairdo to go with. 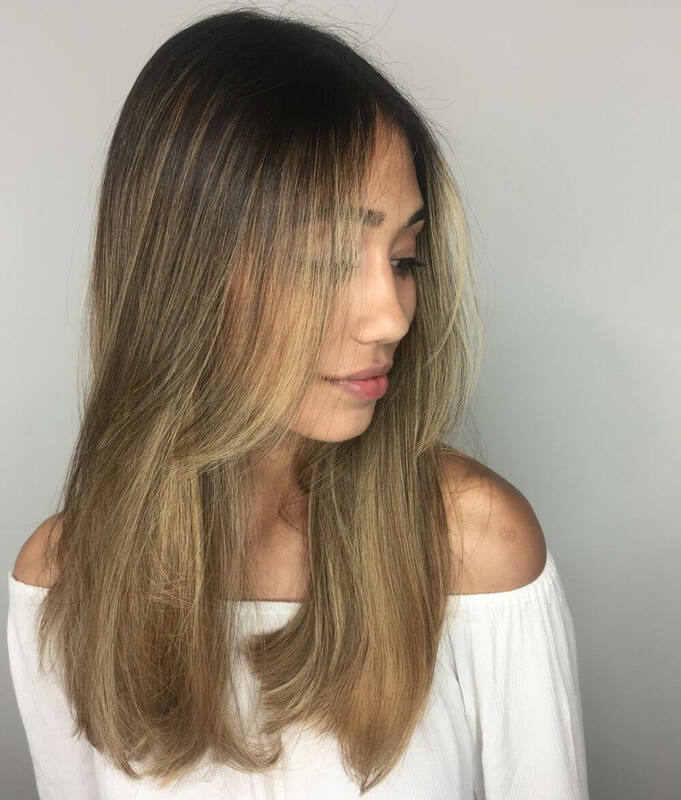 If you are somebody who a wants a different appearance but wants to keep it simple then this straight free-flowing layered haircut can be an ideal one to choose. This hairstyle is not only simple but at the same time it is tasteful. The benefit of owning this look is it that it looks good on all kinds of attire and complements the wear too. Waves are in total craze this season, women of all age love to have a haircut that has waves in them. Women who have thin hair could add waves to their hairdo to give away the illusion of volume in their hair. This particular has delicate waves that come down to provide a dreamy look to the person adorning it. The fringe provided near the forehead divides in both the sides adding up to the overall look. Want a look that is peppy, sassy and totally different from any other look that you might have seen then this is one hairdo is tailor-made for you. The style will look good with women who have really long hair. The waves are messy and give out a feeling that you have just risen from your bed but look ever so amazing. This hairstyle is simple, uncomplicated and stylish. If you are somebody who has blonde hair and doesn’t want to do any change much with those golden looks then this hairdo is sure to adhere to your need. The combination of curls and waves offers for a look that can be carried with any kind of attire and for any occasion. Women, who are always on the go, can opt for this style for a quick fix every time they go out in a hurry. Layers that are lustrous have all the power to change a look in to a chic and modish one. This particular hairstyle is also a simple one but is sleek and makes the person adorning it look immensely elegant. If you are a woman who has a medium length hair but wants to give an illusion of longer locks then this particular hairstyle will help you in achieving the look that you desire. Layers are the best way to enhance the hairstyle of a particular individual. But when the layers are combined with bangs then it turns out to be a beautiful hairdo. This particular hairstyle is straight cut and layers are added to it for a different variation. The bangs that are provided to the haircut are a bit blunt but that too is an added advantage to the whole look. A funky dress or a suit will also look good this particular hairstyle. Waves plus layer make up for a different look. If you are a woman who wants to have a messy but a look that takes less effort to maintain it then you should definitely opt for this one. This free-flowing hairstyle has all the components of a look that can make you carry yourself with style. The ways cut down in layers can be said to be one of the best hairstyles in the list of long hairstyles with layers. Carry this look with all kinds of attire and showcase your unique style among your peers. In this hairstyle, one gets layers that are not only detailed in nature but at the same time comes with highlights which gives the option for the person to choose the color they want to go with. This soulful look has all the essentialities that are needed in a chic and formal look for a woman who want a business kind of style that they can carry to their office and other occasions as well. Style this look with a business suit or skater dress and look ever so mesmerizing. Messy experiments with hair are very much in fashion. But this particular hairdo isn’t a messy one completely. The thinner or tapered cut gives away the feel of a messy look. This hairstyle falls in to the category of casual hairstyles and is perfect for women who want a bit of fun and funk in their overall look. The best part of this hairstyle is you can also tie them up in a knot when necessary and if you open it then you get the same look that you had previously. Style this hairstyle with a funky dress and even simple t-shirt and denim and you can turn heads. Curls are a fashion statement that women of all age love to own but are scared at the same time. But this particular hairstyle is among those kinds of styles that will make you believe that curls can also look good on you. The hairstyle flows freely and ends up in loose curls that will look good on anybody. You can combine this look with any clothing and let your wardrobe decide your look. By embellishing this look you can now say goodbye to the worries of a quick fix of hair when it comes down to a hurried party or picnic. If you are among those women who like style with a pinch of subtlety in them then nothing can impress you more than this particular look. The hairdo is tailor-made for women who love classic hairstyles that have layers in them. This straight and simple look can make any blend outfit look extraordinary thanks to this particular hairdo. The advantage of this hairdo is the highlights that are provided to them. You can choose the color that you want your hair for the highlights and add your signature flavor to the whole appearance. Nothing can beat the feel when the wind sweeps the hair gives a dreamy appearance like this particular hairstyle that sticks to this feel. If you are a possessor of long luscious hair then this particular hairdo is just the thing for you. The free-flowing hair spreads out with faint waves that add up to the feel of gushing wind. Even women with a problem of thin hair can go for this layered haircut. Team this look with your maxi dresses or beachwear and nothing can beat your style and elegance. The above hairstyles are perfect for any women who want to add layers to their hair and dimension to their look. One can choose any of the long hairstyles with layers from the above-mentioned list and turn it in to their signature style. Women owning medium to long hairstyles are the people who will be comfortable in carrying this particular hairstyle that is accompanied with layers. So, if you too have been searching for a look that enhances your overall style then these above necessities are the ones that you should definitely find interesting. How to ace the Celtic Knot Braid?